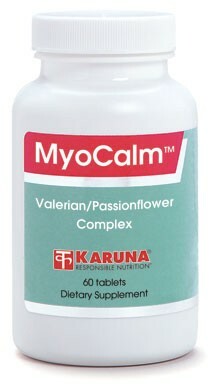 MyoCalm provides a variety of natural agents to promote relaxation and normal muscle tone. Herbal extracts concentrate the active constituents of botanicals, permitting better results with fewer tablets. The 4:1 concentrates of valerian, passiflora and black cohosh used in MyoCalm deliver 4 times the activity of unconcentrated herbs. Calcium and magnesium are essential to normal neuromuscular function. Vitamin B6 is required for the formation of several neurotransmitters, and niacinamide is associated with relaxing effects on mental function according to preliminary studies. MyoCalm does not induce sleep, but enhanced relaxation may facilitate sleep onset. MyoCalm contains a complementary array of ingredients that stabilize neuromuscular function and oppose the tendency toward excessive muscular activity. Passion flower contains flavonoid compounds shown to have relaxing effects (Zeitschrift Phytother 1995;15:115-26). Valerian and passion flower are principal ingredients of numerous herbal calming compounds in the U.K. and Europe. They have been used empirically for centuries to provide an antispasmodic tension relief. Clinical research has documented that valerian/passion flower combinations may help stabilize mood and promote relaxation in humans (Quart Rev Nat Med 1994; Fall:221-4). Black cohosh has improved mood and sleep in women entering menopause (Gynecol Endocrinol 2005;20:30-5; Planta Medica 1991; 57:420-4). Calcium and magnesium are essential nutrients having well-recognized effects on neuromuscular function, although clinical studies of these effects are lacking. Experimental studies and case reports suggest that magnesium has a special role in opposing neuromuscular hyperexcitability (Med Sci Monit 2002; 8:CR326-30; Eur J Neurol 2000;7:741-4; S Afr Med J 1985;68:332-3; Phys. Sportsmed 1983;11:79-81). Niacinamide has been associated with relaxing effects on mental function in animal studies (Nature 1979;278:563-5). Suggested use for adults: Two tablets with breakfast and two more 30 minutes before bedtime. The statements herein have not been evaluated by the FDA. These products are not intended to diagnose, treat, cure or prevent any disease.